The Sinai Peninsula originated when the Arabian and the African continental plates started to drift apart about 20 million years ago, opening the channel of the Red Sea. Today the Sinai is separated from the continental land masses by the Gulf of Suez in the West and the Gulf of Aqaba in the East. 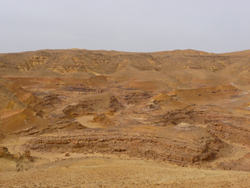 The Northern part consists predominantly of light-brown sandstone sediments, rising gradually from the Mediterranean to the plateau of El-Tih (highest point 1690m). Over the millennia deep canyons and extensive wadi systems were carved out of the crumbly sandstone by intermittent rainfall and wind erosion. This area is extremely dry and hot and difficult to travel in, but the intrepid visitor is rewarded by expansive vistas of silent grandeur and a riot of colours. 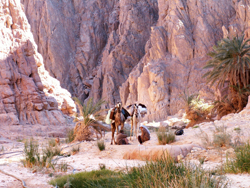 The dramatic high mountain region in the Southern tip of the Sinai, rising to 2645m at Gebel Katharina, presents a striking contrast to the gentle sandstone cliffs in the North: Here the dark, crystalline bedrock is exposed, as exemplified by the beautiful red granite of the mountains around St Katharina village. Most of the high mountain region is now part of the St Katharina’s Protectorate National Park, a paradise for hill-walking and rock climbing. 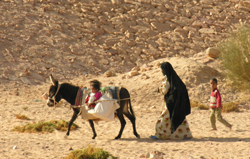 The people of the Sinai are predominantly Bedu (singular: Bedouin). “Bedouin” means literally “desert dweller”, derived from “Badia”, which is the Arabian word for “desert”. 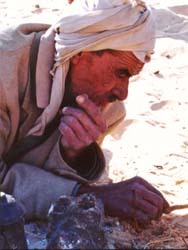 The Bedu arrived in the Sinai in late Pharaonic times as nomads. Each of the tribes occupies its own territory. Today, many of them continue to graze their herds of goat and camel on the sparse vegetation of the interior, near water holes, or cultivate fruit and vegetables in oases and mountain gardens. Others live as fishermen on the coast. 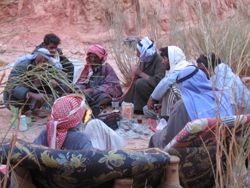 Nowadays the Bedu often work in the tourist trade and traditional handicrafts, in the hotels on the Red Sea coast or as guides and drivers in the interior. However, even in the age of the 4x4 vehicle the camel still holds a very special place in their hearts, a fascination that every guest on our camel safaris will learn to share.